Offering some of the most versatile rock climbing in the country, Independence Pass has nearly a 50/50 split of trad / mixed and sport climbing, with multi-grade, multi-pitch routes and great bouldering, as well. The Pass is the perfect summer rock climbing destination, with habitually warm and dry days, coupled with striking fall foliage, make for some of the season’s most colorful climbing. Independence Pass is bordered by Aspen on the west and Twin Lakes on the east. From Denver, drive I-70 West to 91, south through Leadville to 24 then turn west onto Highway 82 to Aspen (open only during summer months). From Grand Junction drive east on I-70 connecting with Highway 82 at Glenwood Springs. The Colorado Department of Transportation closes Highway 82 for the winter, usually just after Halloween. At that time, the highway is gated approximately 4.5 miles east of Aspen and 10.4 miles west of Twin Lakes. The road generally re-opens Memorial Day to accommodate holiday travelers and the start of the summer season. Year-round climbing can be found on Classy Cliff, Master Headwall and Dragon Rock on the west. On sunny winter days, the Grotto Wall is an easy ski or short snowshoe away. The Dump Wall, Outlook Rock, and Monitor Rock offer year-round climbing access from the east. All other cliffs are climbable as soon as the highway opens. In summer months the temperatures are mild (70’s and low 80’s), while afternoon thunderstorms are common and ferocious, though often short-lived. In the spring and fall, expect periods of sun, shorter days and occasional bouts of wind and rain, even snow. Be prepared for all weather conditions! Most camping on Independence Pass consists of fee-based camping. Difficult Campground, Weller Campground, Lincoln Gulch Campground and Lost Man Campground are on located the west side of the Continental Divide. 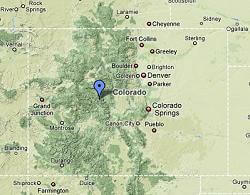 Twin Peaks Campground, Parry Peak Campground and Lake View Campground are located east of the Continental Divide. Free camping can be found along Lincoln Creek Road on the west side. Free dispersed camping east of the divide can be found in the Outlook Rock and Dump Wall areas and .5 miles beyond Lake View Campground. See the USDA Forest Service web site www.fs.fed.us for the most up-to-date information. Independence Pass is a scenic, clean and fragile wilderness. Low impact / leave no trace policies should be followed. Stay on maintained trails as much as possible. Dispose your human waste properly. Toilets can be found at all campgrounds. If toilets are unavailable dig a hole at least six inches deep and 200 feet from any water, trails, campsites or base of climbs. Help keep visual impacts to a minimum. Remove all retreat (or bail) slings or biners that you encounter. Thank you for your help in keeping Independence Pass a beautiful, pristine place to explore! Most modern Independence Pass climbs done today started out as chossy, nearly unclimbable rock. Much cleaning is required. This is because most of the natural, ground-up type of line potential has already been done in the 45 year history of Independence Pass route establishment. Depending on the type of route that you want to put up, please abide by the following local standards and traditions of the Pass. During the early development of Independence Pass, bold routes were established ground up, many without prior inspection. This means that if you want to put up a run-out, adventure climb with sketchy pro, do it from the ground up, with minimal inspection from above. Others willhave to climb these routes at the same level of boldness as the first ascentionists. Due to the nature of the rock, most Pass mixed gear routes were first cleaned then rehearsed on toprope, while trying to leave the rock in its most natural state. Bolts on these routes should be placed with thoughtful discretion allowing for as much natural protection as possible. Rap bolted sport routes should be cleaned and have appropriate protection with thought-out clipping positions. The end result should be a perfect sport climb. NEVER alter existing routes! If the protection on a particular route does not suit your liking or ability, choose another climb. NEVER chip, chisel, glue, or scar the rock. Do not squeeze routes in-between other established routes. Avoid establishing new climbing on crags immediately above the road. They are a hazard to you and passer-byers. All new climbs should include anchors if an obvious or established descent is not present.